Imperial Sports Auctions, a vintage sports memorabilia auction house specializing in rare baseball memorabilia, offers its Vintage Rarities IV auction ending July14th. Highlights Include: Ruth autographed 8×10 photo to personal physician, Lou Gehrig autographed sheet music, signed Callahan Hall of Fame baseball card set with Cobb, Young, Hornsby and more. Callahan Baseball Card Set with Signed Cards of Ty Cobb, Cy Young, Rogers Hornsby and more. Arguably the greatest player who ever pulled on a set of spikes, Babe Ruth put up numbers that were staggering not only for his era but for all time. His memorabilia is probably the most sought-after of all players. Imperial Sports Auctions is offering an 8 X 10 black and white photo signed by Babe Ruth with the inscription: “To A Real Pal Doctor MacDonald From Babe Ruth 6-1-47.” In jet black fountain pen, The Babe’s inscription and signature are mint, with a 9-10 strength grading. The photo itself is of Ruth completing his follow-through, heading towards first base, his eyes following the flight of what appears to be a deep fly ball to right field. “Doctor MacDonald” was Dr. Philip MacDonald, an Ear, Nose and Throat specialist who served as Ruth’s personal physician during The Bambino’s last years. He and his wife became even closer to Ruth’s widow and family after his death. The photograph was given by Mrs. MacDonald to her cousin, who in turn passed it on to her daughter, eventually being obtained by a family friend who consigned the item through Imperial Sports Auctions. A true collector’s gem, in nearly pristine condition, a Thurman Munson single-signed baseball is also part of the July sale and would be a very fine acquisition for any collector. This signed Munson sphere is the best you will find on the market. Walter Johnson certainly earned the designation of “legend” during his 21-year major league career. This original Hall of Fame inductee had 417 career victories and an almost absurd 2.17 career ERA. Imperial Sports Auctions proudly offers a “Pennant,” single-signed baseball by the “Big Train” himself. The ball is in excellent condition, with a sweet spot signature in fountain tip pen. The accompanying full Letter of Authentication by JSA completes this remarkable item. An extremely rare item (with only two other verified examples in the last twenty years) is an autographed sheet music copy of the 1935 song, “I Can’t Get To First Base Without You” featuring Lou Gehrig’s signature. Gehrig’s fountain tip penned single signature, graded an 8 or above, is in excellent condition and was consigned to Imperial Sports Auctions by the daughter of the original “in-person” recipient. Discoveries of previously unknown vintage memorabilia is a rare occurrence, but Imperial Sports Auctions has a unique rarity that has collectors buzzing: The earliest known exemplar of the “Splendid Splinter,” Ted Williams. A circa-1937 multi-signed baseball from the minor-league San Diego Padres of the Pacific Coast League, where the 18-year old hometown native Williams began his professional career is certain to be highly sought-after. A testament to the baseball Hall of Fame, the Callahan baseball card set had only a seven-year production run (1950-56). Imperial Sports Auctions proudly offers a vintage near-set lot of circa-1953 Callahan Hall of Fame cards. These unique pencil-sketched cards include autographed cards of Ty Cobb, Cy Young, Rogers Hornsby and more HOFers along with unsigned cards of 59 others. Imperial Sports Auctions, located in Helotes TX, features quarterly auctions comprised of vintage baseball memorabilia. Our auctions include autographs, cards, game used equipment and other related memorabilia. 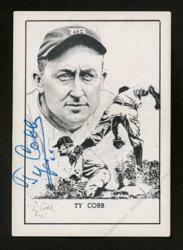 Recently auctioned was a Ty Cobb autographed T206 tobacco card and related ephemera for an impressive $27,600. For additional information, register to bid in our auction, or if you have a collection to consign, please visit us online at http://www.imperialsports.net or call toll-free 877.226.9054.